It’s official. Borderlands 3 is a thing. Gearbox, who’ve apparently been working on this game for the last five years, confirmed its existence during their PAX East livestream a few moments ago. They also released its first gameplay trailer! Though not much is known about this upcoming loot shooter, Gearbox did let on that several characters are returning. That includes an adult Tiny Tina, Rhys and Fiona (from the Tales from the Borderlands series), Brick (from the original game) and more. They also revealed that gamers will be able to travel to different worlds, drive various vehicles, and “loot” over a billion guns. Good times? Good times! And…that’s all we know; aside from a few nods to previous entries in the franchise found here and there, Gearbox is keeping things close to their collective chests. They did say that they’d share more info come April 3rd though. I’m expecting another trailer. Maybe a release window? At the very least, we should find out what consoles/platforms Borderlands 3 is coming to. Update: The original article said that Tiny Tina was a playable character. We’ve come to learn that isn’t the case (at least, she won’t be at launch). We’ve changed the article to reflect this. 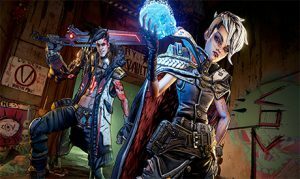 Borderlands 3 launches this September!